On September 9th, 1963 the price of pure silver hit $1.293 per ounce. That was a new record for the 20th century and it caused a problem for the U.S. Treasury Department: coins in circulation were now worth their face value. That is, counting the cost of refining to pure silver (coinage was only 90% silver at that time), a silver dollar in the palm of your hand was actually worth one dollar for the value of the silver in it. There were no silver dollars actually in circulation then, but dimes, quarters and half dollars also contained 90% silver. 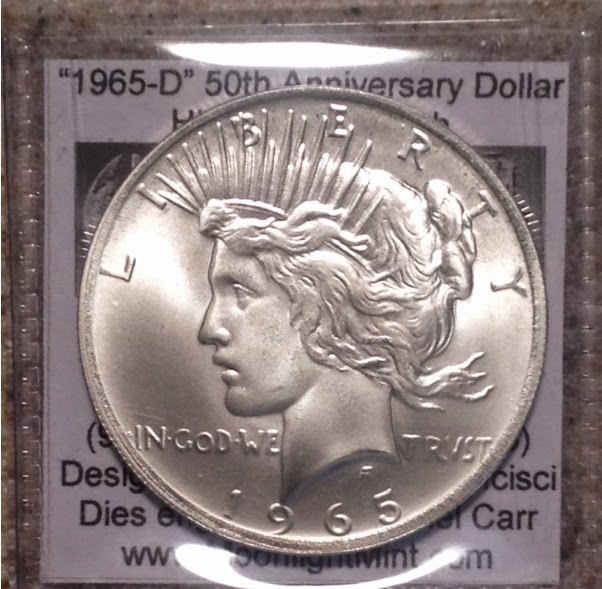 Silver dollars did turn up now and then - they were the chips used at casinos and were popular as Christmas presents. Ten dimes would have weighed just a tiny bit less than one silver dollar, so even the minor coins were in danger of being worth more than their face value. It was the rising price of silver that caused us to stop using that metal and change (in 1965) to the "clad" coins you might have in your pocket right now. Today, with silver prices sometimes 40 times higher than they were then, that may seem like the most obvious and necessary thing to do, but there was not complete agreement on that back then. In hindsight, it seems almost incredible that two Montana Senators (Mike Mansfield and Lee Metcalf) proposed a bill that would start minting silver dollars again. Their solution for the price problem was to reduce the silver content to 80%, which obviously would not have solved the problem for very long. Silver was $1.63 an ounce in 1970 and surged way up in 1980, only to settle down to the $4-$5 range for a number of years. Those 80% silver dollars would have been worth far more than face value. The Senator's interest was because Montana was and is a mining State. The more silver demand, the better for Montana. Silver has many uses (see Wikipedia for details). One use that was quite strong then was photography; that has diminished greatly, but at the time we are talking about, most people expected that use to only increase. "This certifies that there is on deposit in the Treasury of the United States of America (number) silver dollar(s) payable to the bearer on demand." "This certifies that there is on deposit in the Treasury of the United States of America (number) dollar(s) in silver payable to the bearer on demand." That change turned out to be important, as we will see. You see, if you did march down to the Treasury and demand that they make good, they would have paid you in Silver Dollars. With the increase in silver prices, people started doing just that. As I mentioned, casinos were big users of silver dollars. First, that was the tradition. Chips such as are used now are easier to counterfeit and (of course) cost money to manufacture. With rising prices, silver dollars started exiting casinos, so of course casino owners gathered up silver certificates and went to cash them in. In April of 1964, those casinos cashed in silver certificates for some 18 million silver dollars.. and hauled them back to Nevada. The Treasury had plenty of silver to hand out - there were some 1.8 billion dollars in silver certificates outstanding in 1963 and there were 1.7 billion ounces of silver stockpiled. That was not a problem. 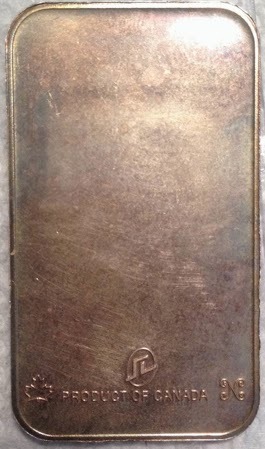 What was a problem, or an opportunity (depending on your point of view) was that many of the silver dollars being handed out had numismatic value - that is, they were valuable to coin collectors. For an example, until 1962 the 1903-O ("O" meaning that it was produced at the New Orleans Mint) was a very rare coin in uncirculated conditions. In that year, many thousands of that date and mint-mark came out of Treasury vaults, driving the price down so much that for a while, they were selling for no more than any other common date. Cherry picking rare dates prior to silver prices climbing sometimes involved trading in for a $1,000 bag, removing any rare dates and then returning the rest to the Treasury - that must have been annoying. As prices started to rise, no returns were made. The numismatic potential was not lost on our Government. They halted handing out silver dollars and instead told people to take there silver certificates to Assay Offices in New York or San Francisco. There, the bearer would be handed an unmarked brown envelope containing .77 ounce of silver (one dollars worth). Needless to say, not too many folks were interested in that trade! At this point, the Treasury had only about 3 million dollars remaining. This was also when Senator Mansfield made a passionate speech on the Senate floor asking Congress to "rescue a major American tradition" and strike 45 million new 80% silver dollars. That law actually passed. President Lyndon Johnson signed it into law in 1965 and - perhaps even more amazing is that in that year, the U.S. Mint in Denver struck over 300,000 dollars dated 1964! These were remelted and not released to circulation (though rumors of very illegal 1964 silver dollars turn up now and then). It was not until 1970 that Congress figured out what to do with the remaining silver dollars. The coins were sorted, graded, packaged and offered for sale in 1972. There was not tremendous interest, so that was shelved and tried again in 1979. This time there was more demand and all were sold by 1980, though not without controversy. So, there are no more bags of silver dollars sitting in Treasury vaults. Decades later, everything has changed. Casinos use chips and often just electronic cards that store your money while you are in the casino. Digital cameras have cut the photographic use of silver in half and it is still falling. You will almost never find a silver coin in circulation (I did find a dime this year, though). Is silver a good investment? At today's prices, it may not be - though I do think it's not at all a bad idea to have a few silver coins around in case of economic collapse. I like the older "Mercury" dimes for that. They are apt to have numismatic value and are therefore slightly more expensive, but they are easily recognizable as being silver. That isn't true for the later Roosevelt series, which became "clad" in 1965 and therefore require closer examination. 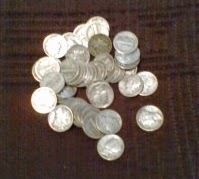 A 50 coin roll of those Mercury dimes might run you around $150 or so. If you can afford it, a few 1/10 ounce gold coins would be nice too, but if you are trying to buy food in a time of economic collapse, a tenth ounce of gold is a lot to pay for a meal. A silver Mercury dime might be just about right. You can also buy 1 ounce bars of .999 silver. These are a bit more bulky than dimes, but their value would naturally be higher - a bar like that might buy you safe lodging for a week. I personally wouldn't recommend silver as an investment - there are still tremendous hoards of coins and silver bars. However, don't trust any investment advice I give: I sold almost all my gold in 2006 when the price was less than half what it is today!